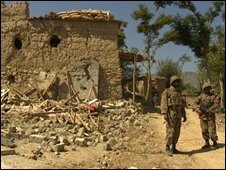 The BBC's Barbara Plett travels to Bajaur where the Pakistani army is encouraging villagers to stand up to Taleban fighters. Helicopter gun ships swoop overhead, preparing to attack. The sound of heavy gunfire echoes around us as we venture out from the military base in Bajaur, a Pakistani tribal area along the Afghan border. The army has brought a group of journalists to this latest front line in its war against militants linked to the Taleban and al-Qaeda. The soldiers take us to Tang Katha, a village of mud brick houses with walls three feet thick. It's a maze of narrow passageways and enclosed courtyards. We're told this was a stronghold from where militants launched ambushes on the army. Troops had to fight house to house to win it back. 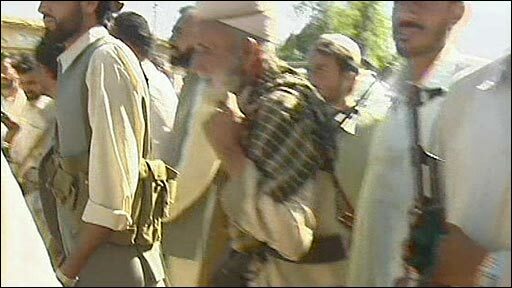 Bajaur is a crucial hub for insurgents. It has access routes to Afghanistan and the rest of Pakistan and the Taleban knows its worth. Money, weapons and more fighters are streaming across the border to reinforce the militants, says the commanding officer General Tariq Khan. "This is the centre of gravity," he says. "If the militants lose it they lose almost everything, and I think they are in the know of this, they understand this and would like to give it their best shot." America backs this operation. But it also wants a widespread crackdown on militant bases, not just in Bajaur, but throughout the tribal belt, and especially those used for launching attacks on international and Afghan troops in Afghanistan. But the Pakistani generals say they don't have the resources for such an all-out war. "One has to prioritise the bigger threat," says army spokesman Gen Athar Abbas. "Is it a compound in [the tribal areas of] North or South Waziristan, or is it Bajaur, which has become a huge stronghold of all the militants?" And the priority for the Pakistani army is to combat a local insurgency that's threatening not only its men, but the very existence of the Pakistani state. Stemming cross-border infiltration is secondary, say observers. 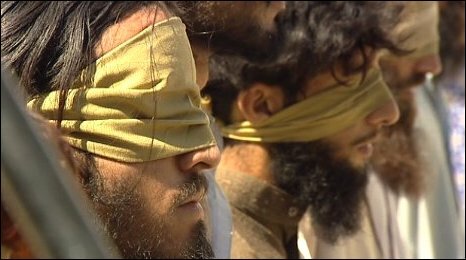 A handful of prisoners are paraded blind-folded before journalists. The army claims that dozens of militants have been captured and up to 1,000 killed. There's no way to confirm this figure. Four of the dead listed as prominent leaders are foreigners: two Arabs, an Uzbek and an Afghan. The army says an Afghan commander named Qari Zia Rehman is leading the largest militant faction. 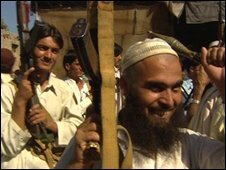 But most of the fighters are local tribesmen, the so-called Pakistani Taleban. Local civilians have been caught in the crossfire. Close to the front line, we drive past empty markets and shuttered shops. Hundreds of thousands have been displaced, and there are reports of civilian casualties. Many blame the army, but increasing numbers are turning against the militants. 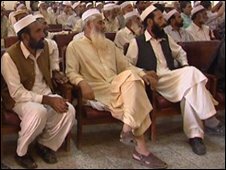 Tribal elders gather in a mammoth meeting place, or jirga hall, to tell us why they support the military offensive. They accuse the Pakistani Taleban of setting up a parallel state in Bajaur, undermining the traditional tribal leadership. They say they've exhausted all attempts at negotiating a peaceful solution to the problem. Haji Karim Salarzai is a leading elder from the Salarzai tribe. "These so-called Taleban do not know even 10 verses of the Koran, and they call themselves religious scholars!" he declaims from a towering podium on a stage at the front of the hall. "They have killed elders of the tribes and innocent people, they are miscreants and they are receiving aid from the foreign countries. They are creating an atmosphere of disturbance which has affected the life of the general public in the area." The anger is leading to action: in a chaotic market place nearby we meet members of the Salarzai militia, armed with rifles, machine guns and rocket propelled grenades. They vow to defend their land not only against the Taleban, but any other intruder. "For the safety of this territory we will fight to the last soul against America and Nato," shout their leaders amid cheers and cries of "God is Great". America has increased strikes in Bajaur and other tribal areas on the Afghan border, targeting suspected militants. "They are all against the American actions here in this country, and they are against the Taleban committing any offence," says Shafir Ullah, the government representative who deals with the tribal elders. "But if Americans continue their activities in the tribal areas, these people will become sympathisers of Taleban." As we leave, the helicopter gunships ready for their next mission. But the army admits there can be no pure military victory against the insurgents. "The winning or victory would be determined when you completely restore law and order, and there is economic development, and you have the confidence of the people," says Gen Abbas. "Whether the people of the area are with you or not is the biggest measure that will determine the notion of victory or winning." The army says it will need six weeks to win the battle for Bajaur. It's going to take longer to win the hearts and minds of Bajaur's people.